Do you find yourself worrying about things? The how, why, what, where questions, are they surrounding you, consuming you at times? God does not want you to worry about tomorrow or anything for that matter. When tomorrow comes, He will have fresh new help and answers for you. He has all the answers that you need for today and tomorrow, no worrying is needed. The next day, God caused such confusion in the enemy's camp that it brought about their own slaughter. Imagine that, they fought against each other and the Bible says that none escaped! King Jehoshaphat and his people did not even need to fight! What they did do was go and take all the spoil they found, which took 3 days because there was so much! So, when you see something in your tomorrow that needs attention, don’t be afraid or dismayed. Look to the Lord for your help and rejoice because victory is yours! 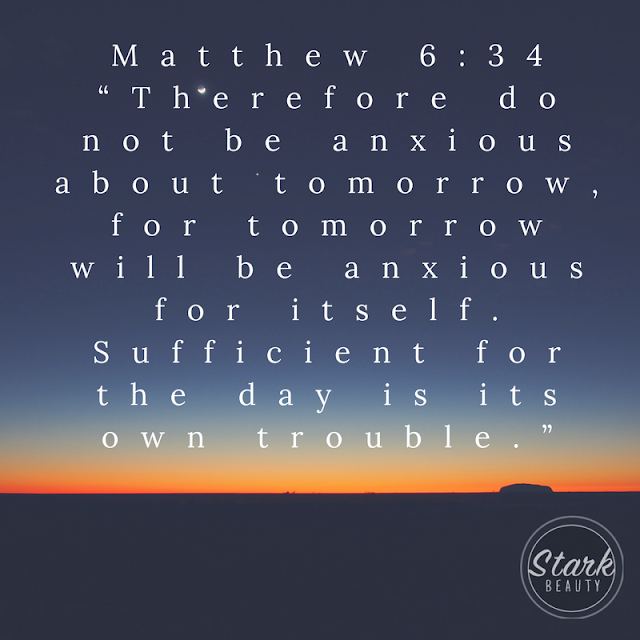 God does not want you to be filled with stress and worry about tomorrow's situations. When tomorrow comes, His grace will come also.